Maker Faire Bangkok 2019, the largest exhibition of inventions and innovations in Southeast Asia, concluded yesterday, 20 January, after a full weekend of technology and creativeness display under the banner “we are all makers”. The event, held at The Street, in Bangkok's Ratchada district, was sponsored by Chevron Thailand Exploration and Production, together with the Ministry of Science and Technology’s National Science and Technology Development Agency (NSTDA), the Thailand Maker Community and other partners. For two days (19-20 January), the fair featured on-stage demonstrations and talks, displaying a wide array of inventions from local and international makers across 70 stalls. Inventions included works from electronic and embedded systems makers, musical instruments, food, woodwork and arts and crafts. All the works displayed were carefully selected by a working committee comprising NSTDA experts and makers. 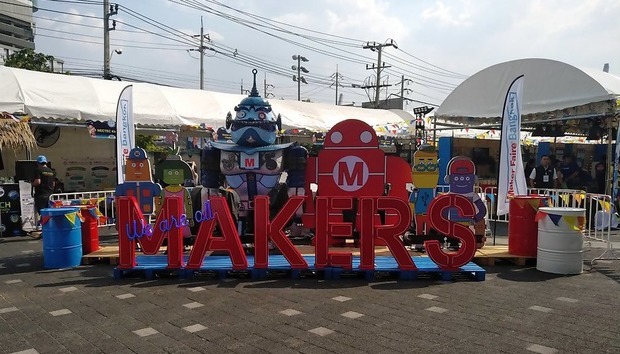 The Maker Faire Bangkok aims to awake interest in science and technology among Thais, expanding on the growing success of previous editions of the fair, and help shaping Thailand into a ‘Maker Nation’. The organisers' ambition is to achieve a Thailand being driven by budding technological prowess, creativity and innovation, in alignment with the Thailand 4.0 goals. “The objective of the faire is to build public awareness and new skills for the young generation so it can be ready for Thailand 4.0,” Nuntawut Pimpaeng, senior consultant, awareness and partnership, at Chevron Enjoy Science Project, told CIO Asia. "NSTDA’s main priority is to support the research and development of technologies and innovations, which plays a significant role in preparing Thais for life in the 21st century and in driving the country towards the Thailand 4.0 era," said Dr Narong Sirilertworakul, NSTDA President. "During the past few years, the maker culture takes on a significant role in supporting STEM (Science, Technology, Engineering, Mathematics) education which encourages active learning through hands-on experiments and knowledge transfer in different fields," he added. Among the makers showcasing their work was Somchai Somphadung, creator of a smart belt that uses sensors and Raspberry Pi to track the wearer’s movements. The belt identifies four types of movement - standing, seating, walking and jogging - and sends relevant information to the user. Somphadung believes that his belt can have a positive impact in the healthtech industry since it can be worn by elderly or dependent people so it can send warning alerts to their family or carers in case of abnormal activity. “If the belt knows what the wearer is doing, [family or carers] can offer assistance to them,” he explained us. Sharing Somphadung’s stand was Chawanwit Poolsri, the creator of a unmanned aerial vehicle (UAV) that can be controlled through the app Line. By using voice or typing commands on Line, the drone was able to take off, flip and land. Other exhibitors included 3D printers, industrial Internet of Things (IoT) solutions and artificial intelligence (AI) powered robots. AIS, Thailand’s first mobile operator, had a booth where it presented its IoT Alliance Programme (AIAP). AIAP is the shared platform among public and private sectors, as well as startups and entrepreneurs, who are interested in fostering IoT development and solutions in Thailand. "Through this programme, AIS makes IoT more widespread in Thailand and helps people here to engage with it," a representative for AIS told CIO Asia. "We are working to make Thais registering into the programme." To achieve its mission, AIS collaborates with every stakeholder in the IoT ecosystem, including device manufacturers and software developers. The fair also featured a contest for school and vocational students focusing on the creation of new technological innovations under the "Green World Innovation" theme. 'Enjoy Science: Young Makers Contest' was divided in two categories: vocational students and general (primary to university) students. Young participants were invited to create artefacts beneficial to the environment that can reduce pollution and improve the quality of life of Thais in the short and long terms. The winning projects were Clean Oyster from Surat Thani Technical College in the vocational category, and Oil Clean-up Robot from Satree Phatthalung School in the general students category. Each category winner received THB500,000 as prize.